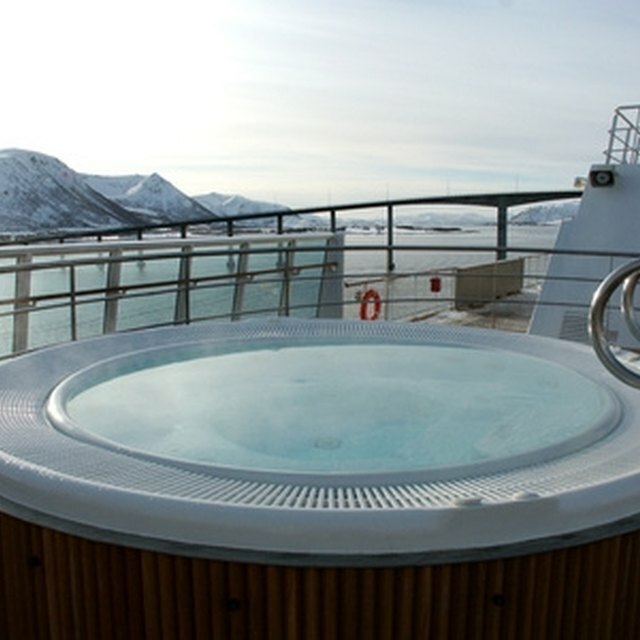 Keeping a frequently used jacuzzi clean and well maintained is important, especially a hotel room jacuzzi. By taking the time to decontaminate and disinfect a hotel room jacuzzi, you prevent a buildup of bacteria, mold and microorganisms as well as prevent any future mechanical problems. Make sure any power connected to the jacuzzi is shut off before you clean or drain it. You don't want to accidentally get shocked. Drain the jacuzzi if there is any water in it. Attach a garden hose to the valve, and slowly drain the water to a sanitary sewer, like a bath tub or sink. Remove the cartridge filter. Clean the filter every time you change the water in the jacuzzi. To clean the filter, simply hose it off or soak it for a few hours in cleaning solution. When it's clean, place it back into the filter bay. Begin to clean the shell of the jacuzzi. Avoid using harsh chemicals as they may damage the shell. Household bleach or other bathroom cleaners will work just fine to sanitize and remove any buildup. Let the cleaner sit for the recommended time on the bottle, and then rinse out the shell. Completely dry the shell with a cotton cloth or towel. Polish or wax the shell using another cotton cloth to spread the wax. This will give the jacuzzi a nice shine. Close the valve, and then begin to refill the jacuzzi with water. While the tub is filling, clean the spa cover by using a specially made jacuzzi cover cleaner that shampoos and conditions the cover. Allow the cover to dry. Reconnect the power to the spa, activate the pumps and set the heat to a desired temperature. Make sure the sanitizer levels for the jacuzzi are set and balanced with the water. You can find jacuzzi sanitizer with balancing instructions at a jacuzzi, spa or hot tub dealer. After the chemicals are balanced, shut off the pumps. Place the cover on the jacuzzi. Jacuzzis can harbor bacteria, especially in hotel rooms, so it's important to clean the jacuzzis after every use.